DANES WORLD: LOOK WHAT DADDY MADE! Mommy and daddy go to a place called Monty-ray after they eat a big turkey dinner every year. This year they said we both get to go with them. But since daddy has to help us into the Big Green Machine a lot, he built us a walking ladder, so we can get in on our own now. After we heard all the noise in the car room, daddy showed mommy what he made. I thought we were going for a walk, but daddy took me out to the green machine and showed me how to use the new walking ladder. I was able to walk right up it like a lady, instead of waiting for daddy to push my rear end inside. I walked up and down a few times, then showed them how smart I was, and stood right in the middle and posed just like a Princess! Then mommy brought Max out too. He was a little scared. But after he heard the mommy voice, he finally climbed up it too. Then he went up and down a lot too. Mommy was so excited that we can get in and out of the Green Machine on our own and not have to worry about us hurting our legs. And Daddy is glad he wont have to hurt his back picking up Max anymore. 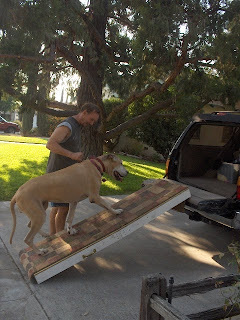 Your dad must really love you to make a nice ramp like that. I use the side door in my mastiff mobile which is only about a foot off the ground. Even so, momma usually has to lift my bottom inside. Your Daddy is a genius! First the giant water bowl... now this! 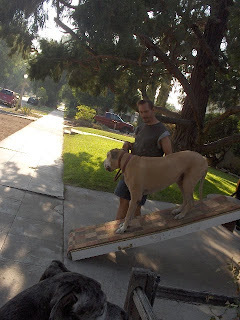 We bought a Ramp for moose but it was expensive! Nice job dad! That is good for everyone it sounds like!